Anyone who ponders a Nomos must confront this question: 35 or 38? Most of the Nomos line comes in these two sizes (plus 39 and now 41). In our modern horological world where most watches are 40 mm and above, it might seems like bigger is always better. But it’s not so clear once we step back from the numbers and consider the watches side-by-side. 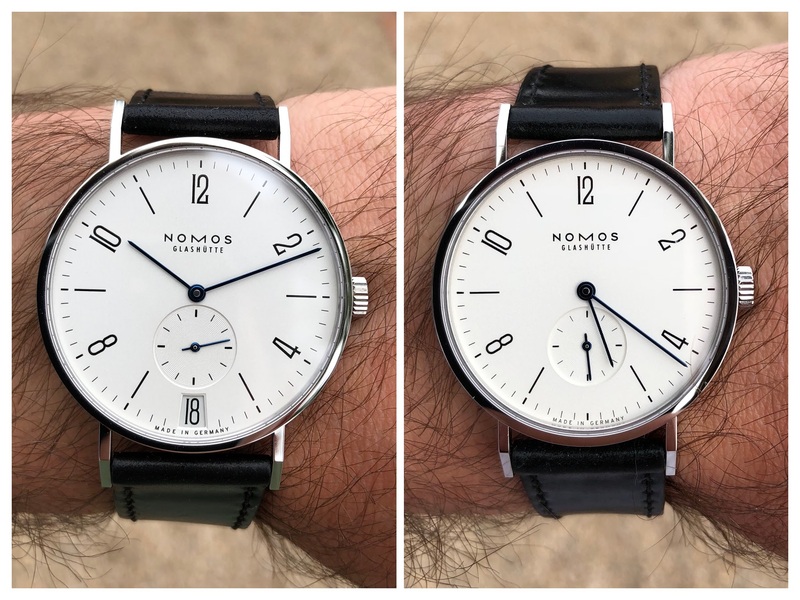 I ordered two Nomos Tangentes (the classic 35 mm and the 38 mm Date), so I could compare them head-to-head; I’ll send back one and keep the other. It’s an in-house bout, the Bauhaus battle, the Glashütte dispütte. Leeeeeet’s get ready to rumble! When I decided to purchase my first Nomos, I picked the archetype: the Tangente. The original Nomos watch and a classic of Bauhaus design, with the brand’s first in-house movement, the manual-wind Alpha (or the related DUW 4101 on the Date). The 38 Date is actually 37.5 mm and it is the clear leader in complications, with a large date window at 6:00 that is perfectly integrated into the hour register. While a date window can ruin a balanced dial, I think Nomos has actually improved the aesthetics of the 38 by filling up the larger dial. So the 38 comes into the ring with a leg-up. But the Tangente 35 has a key advantage over the 38 in this showdown: I like smaller watches. I’d like every dress watch in my collection to be just a little bit smaller. My wrist is a fairly average 7”, so a 40 mm dress watch is at the limit of what my wrist can support. My smallest dress watches right now are 38 mm, and I’d like a smaller watch in the collection. That means the 35 brings its own charms to the fight. We’re deadlocked out of the gate—let’s go to the wrist. The Tangente is all dial, so the watch wears bigger than the numbers suggest. The 38 looks much closer to 40 mm on the wrist, thanks to the big flat crystal and the angular case, both of which emphasize the silvery white dial. Despite the dial-forward design, the 35 still looks much smaller than the 38. It is surprising how just 2.5 mm can completely change the look of a watch. But the 35 still fills my 7” wrist, just in a more understated way. Both watches fit—the lugs don’t overhang on the big boy and the thin <7 mm case means both tend to hide under my shirt cuff. The lugs slant down at a 45 degree angle and the supple shell cordovan leather strap conforms to the wrist. I usually wear my watches with a bit of play between strap and wrist, but not here. The Tangente feels best locked in tight. The long angular lugs contribute to the comfort and add to the dial-forward design. The dial perches on the tips of those slender strap holders and the contrast between the perfectly round case and the straight lugs adds to the prominence of the dial. A word about that dial—it has an effervescent sparkle that is enhanced in the sunken and snailed small second dial. The second dial and hand are slightly larger on the 38, which keeps the proportions similar, but the dial is much deeper on the 35. The smaller small second dial has sharp vertical sides that dramatically cut into the face of the dial. Point to the 35. The slender, flame-blued hands are fantastic on both watches. There is no substitute for the character and depth of flame bluing. If I had to pick a favorite between the two handsets the 38 would get the nod, just because there is more beautifully blued steel to enjoy. Those hands point to printed indices that are sharp and thick, but not overwhelmingly impressive. Both these watches sport similar in-house movements, decorated in similarly stunning fashion. We’ve got Côtes de Genève, beveled edges, blued screws, big jewels, and finished crown and ratchet wheels. The gold text is icing on the cake. Looking at the Alpha and DUW 4101 next to a lightly decorated ETA 7001, the lineage is apparent, but so are the differences in finishing and Nomos innovations like the ratchet mechanism. Who’s it for? The traditional Bauhaus crowd. Would I wear it? I am. Standout feature? Bauhaus design, in-house movement. Who’s it for? The bigger Bauhaus crowd. Would I wear it? I could, but I picked the 35 mm because it’s a bit more unique. Standout feature? Big date window that doesn’t upset the dial. Previous articleCan you tell your chronograph from Shinola? The Shinola Canfield Sport can!